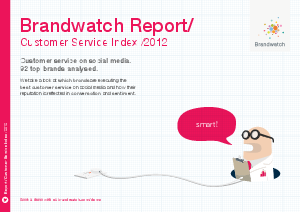 In 2012, Brandwatch analyzed 40 leading brands in the UK to determine which brands performed the best when it came to social customer service, and how their reputation is reflected in conversation and sentiment. The results? Online customer service conversation about these 40 brands declined in tone as more and more consumers turn to the social web to discuss problems rather than praising brands. Download this report to learn more about what we discovered about how brands handle customer service online and which brands excel (or not) across various social channels.